Today, in the following article, we will talk about a protein-rich healthy dish which is extremely delicious and can help you in quick weight loss. 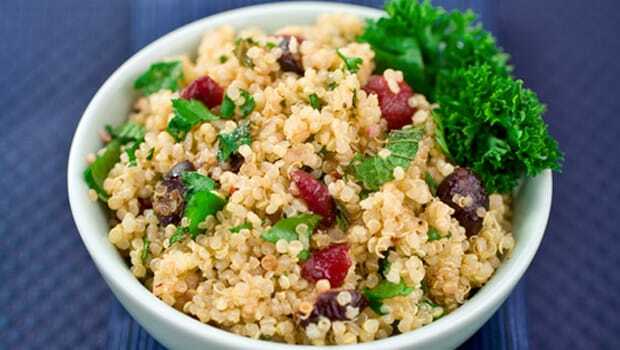 The whole grain quinoa is a fiber-rich as well as a complete source of protein. What??? Your old clothes don't fit you any more? Is weight loss your new health goal? Are you thinking of following a fad-diet to lose weight? Well! Let us tell you that fad diets aid in short term weight loss and may have many health hazards. Today, in the following article, we will talk about a protein-rich dish which is extremely delicious and can help you in quick weight loss. Even better it will help you manage your weight forever. The dish we are talking about is quinoa and lentil dish. You can have this dish in your morning breakfast, dinner or even a light evening snack. Let us have a look at the health benefits of this dish and how it helps in weight loss. This dish has all the nutrients which help in weight loss. Nutrients like fiber and protein are beneficial for weight loss. This is because the two nutrients help you keep fuller for longer and promote fullness. This in turn curbs your hunger pangs and you do not overeat in the next meal. The whole grain quinoa is fiber-rich as well as a complete source of protein. This means it contains all the nine essential amino acids making it a perfect option for those who are vegans or vegetarians. Moreover, it is easy to prepare and is gluten-free. The whole grain is known for its mild flavour, subtle chewiness and versatility. Though the grain is a bit bland in taste, you can add lentils, some vegetables, curd or even lemon juice to enhance the flavour of this protein-rich dish. Lentils are an easy-to-cook legume and are rich in proteins and fibre. You can add lentils to many dishes like salads, stews, soups or can be eaten with quinoa or rice. They are extremely nutritious, providing you all the essential nutrients one can imagine. These include fiber, folate, iron, potassium, phosphorus, magnesium, calcium and protein. However, the protein in lentils is incomplete, as it does not contain all the essential amino acids. But if combined with quinoa or rice they make for a complete meal rich in proteins. Boil quinoa and lentils separately. In a side dish you can stir fry some vegetables like carrots, beans or capsicum. Mix in all the ingredients. You can add a pinch of salt, lemon juice or pepper according to your taste. The dish is simple to prepare and extremely delicious.